Pope Benedict XVI today named Bishop William E. Lori of the Diocese of Bridgeport, 60, as the 16th Archbishop of Baltimore. He will succeed Edwin Cardinal O’Brien, who served as Baltimore’s archbishop from October 2007 to August 2011. Cardinal O’Brien has served as Apostolic Administrator of the nation’s oldest Archdiocese since his appointment August 29 as Grand Master of the Equestrian Order of the Holy Sepulcher of Jerusalem. Cardinal O’Brien will remain as apostolic administrator until Archbishop-designate Lori’s installation on May 16, 2012. “The very thought of serving and leading the Nation’s Premier See fills me with joy and also with profound gratitude, first and foremost to the Lord who shepherds His people in love. “I am grateful to our Holy Father Pope Benedict XVI who has entrusted to me the stewardship of this great and historic Archdiocese and to Cardinal O’Brien, Cardinal Keeler, and their predecessors stretching back to Archbishop John Carroll. “In particular, I wish to thank Cardinal O’Brien together with Bishop Madden and Bishop Rozanski and many others for their gracious welcome, wise counsel, and assistance. In the coming days and in the years ahead I look forward to working with the priests of the Archdiocese, visiting our parishes, schools, and charities, and working closely with the laity, religious, and deacons – indeed all whose witness to Christ and whose spirit of loving service enable this historic Archdiocese to proclaim the Gospel afresh in our times and bring its truths and values into the public square. A native of Louisville, Kentucky, the 62-year-old Archbishop-designate received his Master’s Degree from Mount St. Mary’s Seminary in Emmitsburg and was ordained a priest for the Archdiocese of Washington in 1977 by William Cardinal Baum. His first assignment was as Associate Pastor of St. Joseph Parish in Landover. Thereafter, he served as secretary to James Cardinal Hickey, Chancellor, Moderator of the Curia and Vicar General. He was ordained a bishop by Pope John Paul II in 1995, serving as Auxiliary Bishop for the Archdiocese of Washington until 2001, when he was appointed spiritual leader of approximately 400,000 Catholics worshiping in 87 parishes in Fairfield County, Connecticut. During his episcopacy in Bridgeport, Archbishop-designate Lori launched several initiatives in support of Catholic education, vocations, Catholic Charities, and evangelization. In 2004, Archbishop-designate Lori announced a major restructuring of the Diocese of Bridgeport’s 37 Catholic schools, which educate more than 11,000 children. Changes in governance, funding and curriculum have led to a resurgence in the diocesan school system, most notably in nearly a third of their schools receiving the U.S. Department of Education’s Blue Ribbon designation, a recognition that diocesan student scores rank in the top 10 percent of all schools, public or private, across the nation. He also oversaw the formation of the Cathedral Education Cluster, a partnership of six inner city schools aimed at ensuring continued access to Catholic education for families in Bridgeport’s poorest neighborhoods. Archbishop-designate Lori’s apostolic ministry in Bridgeport has been marked by particular emphasis on vocations, seeing 35 priests ordained and having 39 seminarians presently in formation. Further, eight orders of women religious and a new religious institute were all welcomed into the Diocese of Bridgeport during Archbishop-designate Lori’s tenure. Under Archbishop-designate Lori’s leadership, Catholic Charities in Bridgeport dedicated 22 supportive-housing apartments for at-risk families. The agency now provides much needed housing to 225 individuals and its food pantries serve over 1.2 million meals annual to the working poor, homeless and elderly. In 2006, the Diocese launched “Following in the Footsteps of Christ,” a pastoral plan for evangelization that serves as a roadmap for the Diocese by identifying key areas to make the Gospel better known to the people of Bridgeport: participation in the liturgy; support for family life and married couples; formation for young people; adult faith formation; and service to marginalized individuals. Archbishop-designate Lori has served on several committees of the United States Conference of Catholic Bishops, including the Ad Hoc Committee on Sexual Abuse, where he was instrumental in drafting the landmark Charter for the Protection of Children & Young People. He is also a current member of the Committee on Doctrine, the Pro-Life Activities Committee and the Ad-Hoc Committee for the Defense of Marriage. Archbishop-designate Lori is the Chairman of the newly-created Ad Hoc Committee for Religious Liberty and has been a courageous voice for upholding marriage between one man and one woman, and for religious liberty. Archbishop-designate Lori is also a member of the Mount St. Mary’s University Board of Trustees. In 2005, he was elected Supreme Chaplain of the Connecticut-based Knights of Columbus, where he has the responsibility of overseeing the spiritual welfare of the order’s 1.8 million members and their families. Archbishop-designate Lori writes a series of monthly articles for the order’s magazine, Columbia. Cardinal O’Brien said of Archbishop-designate Lori’s appointment, “I have known Bishop Lori for many years and have been impressed by his deep love of the Church and her people, and by his extraordinary work both as Bishop of Bridgeport and as a valued leader on behalf of the United States Conference of Catholic Bishops. 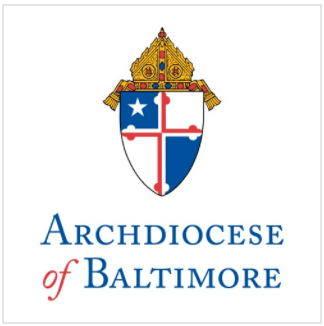 Founded in 1789, the Archdiocese of Baltimore is the oldest Catholic diocese in the United States. It is home to 504,000 Catholics who worship in over 150 parishes located in Baltimore City and the following counties: Allegany, Anne Arundel, Baltimore, Carroll, Frederick, Garrett, Harford, Howard and Washington. Each year, the 70 Catholic schools in the Archdiocese educate over 28,000 students. The largest private provider of human services in the State of Maryland, Catholic Charities’ programs annually serve over 160,000 individuals.